Chrystia Freeland has earned a wave of admiration from the country's auto industry. OTTAWA — The fate of Canada’s auto industry could rest on the slim shoulders — or maybe on the bicycle cargo rack — of a cerebral Torontonian who doesn’t actually own a car. Not that Chrystia Freeland is adverse to driving. Just last summer, Toronto Life magazine recounts, Canada’s minister of foreign affairs borrowed her father’s decades-old Ford Taurus to take her children camping in the Rockies of British Columbia. Nor has she shown unease steering the efforts to end an escalating trade war with the United States that in the view of David Adams, president of the Global Automakers of Canada, poses “existential threats” to a mainstay economic sector. 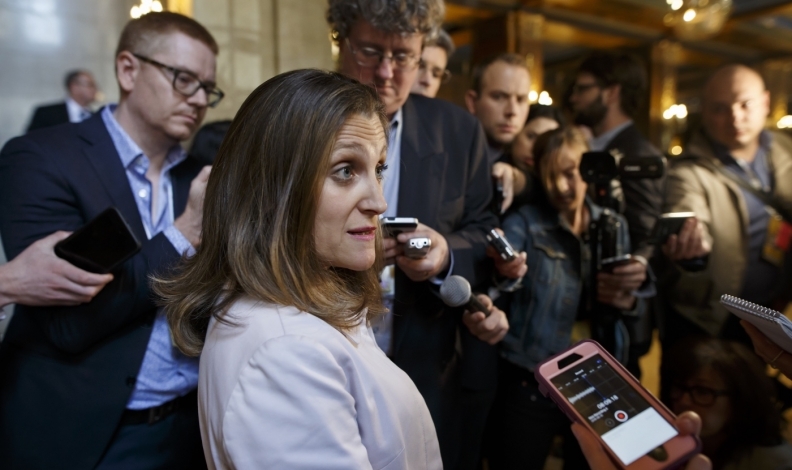 Focused and informed, Freeland has earned a wave of admiration from the country’s auto industry as she works to protect Canada’s interests in a revamped North American Free Trade Agreement (NAFTA) demanded by U.S. President Donald Trump. “She can certainly hold her own in any discussion, whether it be the auto file or any other file related to NAFTA,” said Adams. Freeland’s key strength, said Jerry Dias, president of Unifor, which represents 40,000 auto-industry workers, is her willingness to hear other views. “She’s incredibly intelligent, no question, but she’s not a person who’s afraid to listen and to take other people’s advice, because she doesn’t claim to have all of the answers.” he said. For a Rhodes scholar whose study of global elites and the concentration of wealth was an international best-seller, this lack of pretension is striking. Her upbringing, however, in Peace River, Alta. — “about as backwoods as it gets,” according to a New York Times profile of Freeland — could make it easier to understand. If life on her father’s farm gave Freeland a prairie practicality, her strong Ukrainian roots on her mother’s side were another influence. She adapted the Ukrainian form of her first name, Christina, and studied at the University of Kiev as an exchange student while earning a degree in Russian history from Harvard University in Cambridge, Mass. Freeland returned to the family homeland during the collapse of the Soviet Union, and launched her journalism career as an Eastern Bloc freelance reporter for international newspapers. Next came a master’s degree at University of Oxford in London, England, and an appointment as Moscow bureau chief for the Financial Times. There, her frequent criticisms of Vladimir Putin helped put her on a sanctions list that bars her from entering Russia. Other senior news jobs followed — deputy editor of the Globe and Mail, managing director at Reuters — before she was wooed by Justin Trudeau, a fan of her foreign policy views, to replace Bob Rae as member of parliament for Toronto Centre, a riding she won in a 2013 by-election. When the Liberals formed the federal government in 2015, a cabinet role was assured. Freeland became minister of international trade and then in 2017, with Trump in the White House and making good on his promise to re-open NAFTA, took over foreign affairs with additional responsibility for CanadaU.S. trade. The Times calls the post “the most consequential portfolio in generations” in Canada's Parliament. Freeland isn’t holding up the side alone, even if it may seem that way on TV. Canada has a carefully picked NAFTA team headed by chief negotiator Steve Verheul, a respected trade diplomat. But the public servants have remained largely in the background while elected officials — notably, in the case of the U.S., the president -— make public pronouncements. Gordon Ritchie, who served as Canada’s ambassador for trade negotiations in the 1980s, says Freeland’s prominent role is intended. “You have to structure your lineup to reflect the lineup on the other side,” said Ritchie, one of the principal negotiators of the Canada-U.S. Free Trade Agreement that preceded NAFTA. With the air time, however, comes celebrity-level scrutiny. Type in “Chrystia” and Google’s suggested searches reveal keen public interest in Freeland's family details [she and husband Graham Bowley, a New York Times reporter, have three children and live near Toronto’s trendy Annex neighbourhood]. News reports in 2016 captured an emotional Freeland holding back tears during contentious negotiations for a trade deal with the European Union. Freeland, who turns 50 in August, hasn’t won every battle. At Reuters, she oversaw a multi-million-dollar project to revamp the news agency’s website, a project that collapsed because of what would later be described as confusion stemming from top-executive turnover and fears the site would syphon profit from other divisions. The threat of a vastly bigger defeat looms in the trade talks, which Canada wants to resume this summer. Trump has suggested the talks can wait until after the fall U.S. midterm elections, even as he steps up pressure on trading partners with tariffs on steel and aluminum imports — answered on July 1 with Canadian duties on U.S. exports — and a threatened 25-per-cent levy on all vehicles imported into the United States. She must not only resist Trump’s demands for concessions, but satisfy a constituency at odds over what a finished deal should look like. The manufacturers hope for the status quo, while labour is calling for measures to stop the flow of jobs to low-wage Mexico. Freeland, meantime, is hoping for the best, but ready for “pretty much anything” as the bargaining plays out. “We expected that there would be moments of drama in this process, and I think that prediction has been borne out, and I think all of us at this point fully anticipate there will be some moments of drama in the future,” she told reporters at a Hamilton, Ont., steel mill in June. Ritchie has “no criticism whatsoever” of Freeland’s performance in an environment he says is far more difficult than anything he ever faced.